The best of the best! Luquillo has the best beaches in Puerto Rico and Playa Azul beach is one of them. And the Playa Azul Towers are right there. Tower 1 has the best view of the ocean, and this apartment sits high on the eleventh floor of Playa Azul 1, with a commanding view of nature's best. It is a one-bedroom unit ideal for a romantic get-away or a small family. The bedroom has a huge king-sized bed and its own window looking out to the ocean. Plus at the eleventh floor you can still hear the soothing sound of the waves. The bedroom has a very efficient A/C unit, but many renters do not use it preferring to sleep to the sound of the waves and the usual breeze of the easterly trade winds. There is a very comfortable futon in the living area that allows for up to two additional people, and which is also great for mid-afternoon siestas. The kitchen is well-equipped with stainless steel fridge, stove and microwave. This apartment is new on the rental market. Come once and you will surely return many times. I'm sure you would rather be in it right now! The gated Playa Azul Complex is located one mile from world-class Luquillo public beach, one of the most famous and beautiful beaches in Puerto Rico. The complex sits on its own large crescent beach with gentle waves - perfect for body surfing, sunbathing, or strolling. Luquillo public beach is a short walk to the West and an excellent surfing beach ('La Pared') is a short walk to the East. Inside the complex you will find tennis and basketball courts, two pools (including a toddlers pool), play equipment for kids, and a clubhouse. A grocery store, drug store, gas station, bank ATM, Laundromat, and several restaurants are within walking distance. 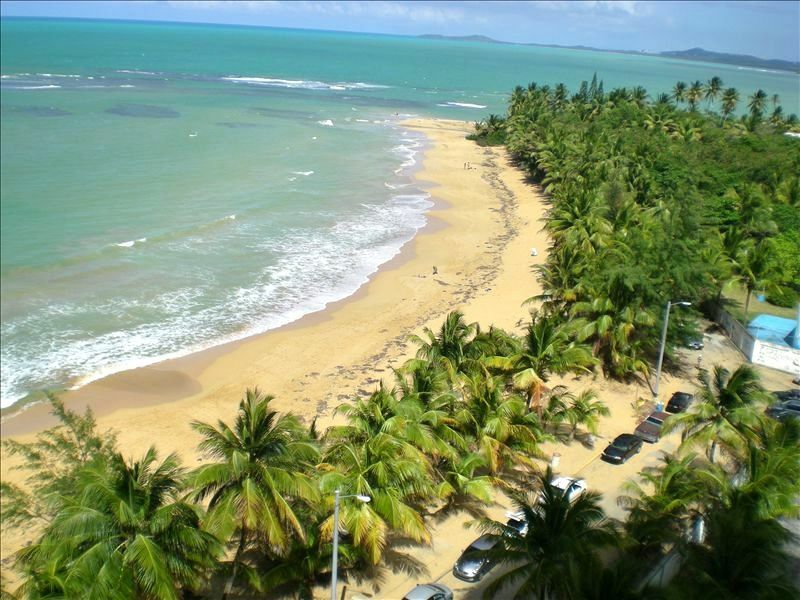 The condominium's location in Luquillo is ideal for exploring the Eastern part of Puerto Rico. The El Yunque National rainforest is just a few minutes West on Route 3 and Fajardo, with ferries to Culebra and Vieques - the Spanish Virgin Islands, and its own natural wonder bioluminescent bay is a few miles East. Shopping in old San Juan and at the outlets are just 20 to 40 minutes away. Several championship golf courses are located at several nearby golf resorts within 10 miles. Stay in Playa Azul for a fraction of the cost of a hotel and enjoy the best of Puerto Rico! Puerto Rican native who loves the island and its beautiful beaches. Chemical Engineer by profession and adventure traveler by vocation. Worked over 25 years in the pharmaceutical industry and now living the dream. Blessed with the opportunity to own this amazing property in such a unique and privileged location. You can find additional, and contact, information at our facebook page "Beach Paradise Villas"
11th floor, high enough for a great view, low enough to hear the soothing sound of the waves. in the nearby Laundromat or just leave in the balcony to wind/sun dry. with its own domino table-- and what a great view at no additional cost. Two swimming pools in the Playa Azul complex, including one for toddlers. Hair-dryer and two portable beach chairs are included for your use during your stay. Great location. Just walk across the street to a nice beach. For the price , the apartment was comfortable whit a nice sea breeze. Thank you! Glad you enjoyed your stay! We actually ended staying at this place because our flight back to the US was canceled due to snowstorm. How lucky for us. The place we were staying originally was Sandy Hills. It was very disappointing but we were prepared to stay since it was only for a few days. However, they could not accommodate us and we found this place instead. What a contrast. It was clean, comfortable and only steps to the beach. Having drinks on the terrace facing the ocean cannot be beat! Clearly, the owner understands that you have offer people a clean, equipped, and safe place. Thanks very much for your visit and review. You are welcome back anytime. Perfect Little Spot for Our Mini Getaway!! The owner was great to work with and very quick with responding to any questions. The condo was stocked with everything we needed. It faces the ocean and the view is spectacular! We really loved the balcony and spent a lot of time in the morning with our coffee, reading and taking in the beauty. Access to the beach is just out the door and across the street ... loved walking in either direction by the water. The beach never seems to be that crowded. There are several good restaurants in town, but what is really fun is eating at the Kioskos! These are little restaurants all in a row along Route 3 with a huge variety of different food options (mostly latino). Super close to El Yunque & and Fajardo. And, it doesn't take long to drive to San Juan and visit the old city, which is beautiful! We hope to return soon! Thanks so much for your visit and review. You are more than welcome back. Great unit, great location, Luquillo was wonderful. Really appreciated the staff at Playa Azul! Thanks for your comments. We are happy you had a good time. I traveled with 2 of my friends and we had an absolute blast! We were close to everything. Snorkelling in Fajardo, El Yunque rainforest, 45 minutes to San Juan and a super short walk to the beautiful beach of Luquillo. Luquillo had the best beach out of the island, Crystal clear water and not crowded with tourists. The view from the balcony was amazing. The entire condo is gated so I felt very safe the entire time We are already planning to go back soon! We stayed here over the 4th of July weekend. The bedding could use an upgrade, and there were no instructions for the air conditioner. This is minor, but no one warned me that dish soap and paper towels were not included, so we had to make a special trip to the store. Also, there is a clothesline but no pins. However, the apartment is a good size for a couple or small family, the balcony is lovely, everyone in the building was really friendly and there were a lot of families staying there. The beach really is steps away and the view is great! Cancellation Policy: If booking is cancelled more that 15 days prior to check-in, 50% of deposit refunded. If cancelled within 15 days of check-in, no refund of deposit.